We’re going to start this blog post with a fact: having a nice, good-looking yard is…well, nice. Okay, maybe that’s our biased opinion as residential and commercial landscapers in Gainesville. Even if that’s actually not a fact, it’s not like anyone has looked at a well-designed, lush yard with disdain — at least, we hope not! 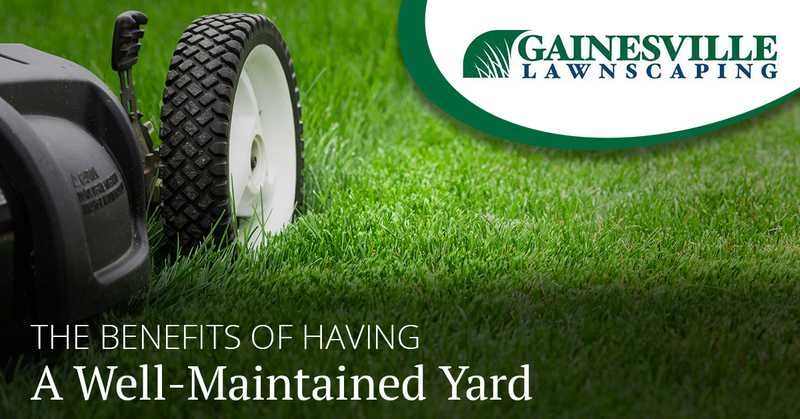 Really though, having a well-maintained yard as a result of working with a professional landscaper is worth its weight in gold. Depending on if we’re concerned with designing the perfect yard at home or creating a welcoming space for customers or clients at your business, there’s always a great reason to care about what your yard looks like. Actually, there are multiple reasons why you should have a stunning-looking yard, and that’s going to be our topic of focus in today’s blog post! In our previous post, Gainesville Lawnscaping welcomed our readers and highlighted our residential and commercial landscaping services in the greater Gainesville area. Read more below as we go a little deeper into landscaping benefits, or feel free to contact us if you have any questions. Let’s get started! Not only is a nice yard easy on the eyes, but it’s also a surefire way to improve property value. If you’re planning to sell your home or just putting a feeler into the market, investing some hard-earned dollars into residential landscaping is a great way to ensure that you’re getting the desired asking price for your home. Maybe you have a small office space in downtown Gainesville, or you even operate your business from your home. Do you really want customers to walk up to your front doors through dead grass, 10-year-old mulch and three dying shrubs for vegetation? Sure, that’s an unfair rhetorical question, but this scenario isn’t going to help retain business. A professionally designed yard from our Gainesville commercial landscaping services helps create a warm, welcoming environment to greet customers or clients. What’s the point of having a good-sized property if you’re just going to spend all of your time indoors? Our warm Florida evenings and temperate winters are times to be treasured outdoors. By creating the perfect backyard with features like a hammock, deck, and of course, a large grassy area, you’ll optimize your property by creating more space to spend time in. Simply put, no one wants to sit down on dying grass. It’s your home and it’s your business. These buildings and surrounding areas are reflections of you, so make sure that your landscaping looks good! Bonus: a well-designed and healthy yard will make some of your neighbors envious. Take that, Bob! Contact Gainesville Lawnscaping For Residential And Commercial Landscaping Today! Here in Gainesville, the best time to overhaul your yard is…now! Whether you’re in the surrounding areas of Newberry, Jonesville, High Springs, Alachua or Lake Butler, we’re ready to help. Get started today.